A new tourism campaign in Fife hopes to promote visitor attractions in the centre of the Kingdom. Heartlands of Fife looks to showcase ancient sites, facilities and natural heritage in the middle of the region – Kirkcaldy, Glenrothes and Levenmouth. The areas often sit in the shadow of the East Neuk and St Andrews which soak up big numbers of visitors. The new campaign hopes to involve local businesses and venues as well as local people to help grow the economy – and fly the flag for towns rich in heritage and packed with places to see. Councillor Alistair Cameron said that tourism is currently an untapped source for the area. He added: “Local hotels all seemed to be promoting St Andrews or Edinburgh, there was nothing for central. A total of 5000 brochures have already been distributed to venues, attractions, hotels and local businesses, and the response has been described as very positive. 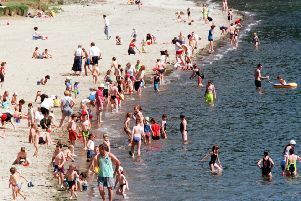 Councillor Ian Cameron hopes that in promoting tourism, it will help grow the economy in Fife. He said: “Everywhere seemed to be promoting things around us, but locally we weren’t utilising our assets. “While promoting Fife will give a strong sense of place to locals, it would help grow a strong local economy too. “By pushing local hotels and restaurants, we can increase tourism, and in turn create new jobs. “Food in Fife currently makes up 30 per cent of the economy and we hope to see that grow. Fife has numerous golf courses, and in the future it is hoped this will become a pillar of tourism, with events like golf tours taking place. Ian said: “We have all these golf courses in Fife, and there are obviously the big ones such as St Andrews, but we have a lot of public ones too. Members of the Heartlands of Fife Local Tourism Association have all had a hand in putting together this exciting brochure which was produced by Fife Council Tourism Team and printed in Glenrothes.